Will we see a Darrelle Revis-Patriots reunion? Could we actually see free agent cornerback Darrelle Revis back in a New England Patriots jersey? There have been a lot of talks about it lately as he was released by the New York Jets earlier this offseason. Ben Volin of the Boston Globe reported that a league executive said the Patriots “are the only team that makes sense” to sign him. 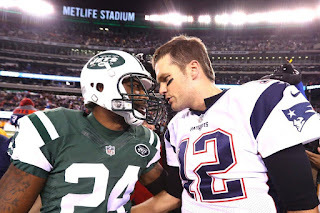 Revis is an aging cornerback with personal baggage. So, if he’s still all about the money and wants to play in the NFL in 2017, he’s going to have to think again. Currently, the 31-year-old is going to get $6 million from the Jets in 2017 whether he’s playing football or not. The Patriots could potentially get Revis for $1 million-$2 million and have the Jets pay the rest, but that would mean Revis would essentially be playing for free. Could Belichick and the Patriots talk him into doing so? Or better question, would they even want to?